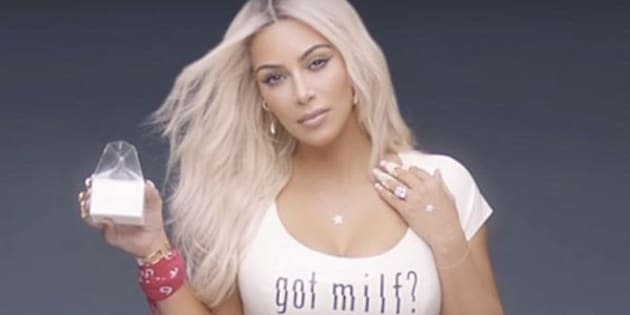 A corset, not Photoshop, may have affected the way Kim Kardashian's waist appears in this video. Kim Kardashian has no time for your criticism. After dousing herself in milk for Fergie's new "M.I.L.F. $" music video, the reality star hit out at haters who were saying her waist was photoshopped. The 35-year-old responded with a Klassic Kimmy Snapchat, writing "F*ckYoPhotoShop #CorsetLife." While Kardashian says she didn't use any editing software, she implied her waist does look different because of her corset. Kardashian has been accused of editing images before, most recently when eagle-eyed fans noticed that she'd gotten rid of a few stray hairs and slimmed down her neck in an Instagram photo.